I found a recipe for Angel Food Cake in The Southern Living Heritage Cakes Cookbook I bought at a church's secondhand store. I love browsing through those small, quaint stores and usually leave with multiple bags full of great items. On my last visit, I left with 6 cookbooks! A treasure for me since I read them like novel. Not just once but time and time again. Over and over, from one cookbook to another and back again. I changed this just a bit. The recipe calls for water. I did add it, however, I think next time I will leave it out. I also used egg whites I bought at Walmart instead of fresh eggs. I didn't have another use for the yolks and didn't want to waste them. I added a bit more cocoa and extract. Feel free to change the extracts to 1 teaspoon vanilla and 1/2 teaspoon almond instead of all vanilla. 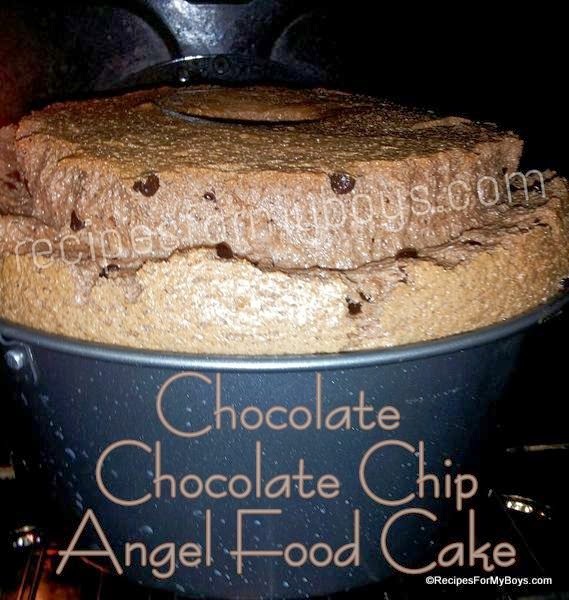 Let's get started making our Chocolate Chocolate Chip Angel Food Cake. Beat egg whites until foamy. Add cream of tartar and salt. Gently fold in flour and cocoa mixture. Gently fold in mini chocolate chips. Toss with flour/cocoa mixture first. Immediately invert pan until cool. Remove pan once cooled. I took mine off a little early. I also left it upside down. Preheat oven to 325 degrees F. Sift flour and measure, spooning lightly into measuring cup. Sift cocoa and measure same as flour. Mix sifted and measured flour and cocoa together, putting 1/4 cup aside. Add chocolate chips to 1/4 cup flour and cocoa mixture. In a stand mixer or very large bowl, beat egg whites until foamy. Add cream of tartar and pinch of salt. Beat until soft peaks. Add sugar a few tablespoons at a time or in a slow stream. Beat until firm peaks. Gently, yet thoroughly, fold in 3/4 cup flour and cocoa mixture. Gently, fold in vanilla or vanilla/almond extracts. Gently fold in mini chocolate chips. Pour into UNGREASED 10" tube pan. Smooth top. Bake 45 minutes or until top springs back when lightly touched. Remove from oven and immediately invert pan. Let cook 1 hour or until cool. Place on serving plate. Serve with fresh fruit, whipped cream, chocolate ganache, chocolate syrup ... you get the idea. Enjoy! If you like my recipes...please sign up for my newsletter. Thank you!